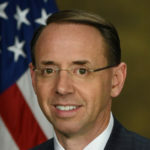 This morning, multiple major news outlets reported that Deputy Attorney General Rod Rosenstein was planning to resign as soon as William Barr is confirmed as Attorney General. This story rang very false. First, Rosenstein isn’t going to abandon Robert Mueller this close to the finish line. Second, the media has spent months reporting that Rosenstein was resigning, and every time it’s proven false. Now it’s turned out to be false again. Hours after the initial widespread false reporting, NBC News is now confirming that Rod Rosenstein is staying on until Robert Mueller’s work is done. Earlier this month Mueller extended his grand jury by another six months, meaning that Rosenstein isn’t going anywhere anytime soon. That’s no surprise, as Rosenstein isn’t the kind of guy who’d walk away before his job of taking down Donald Trump is complete. So why does this false reporting keep happening? Our guess is that the Trump regime wanted a distraction from Donald Trump’s ineffective prime time speech last night, so it had a Trump loyalist in the DOJ leak to the media that Rosenstein was preparing to resign. The major media outlets had to have known that this sourcing was illegitimate, but the “Rosenstein is resigning” narrative has proven to be such a ratings boon, they couldn’t help themselves and ran it anyway. The thing about a fear mongering false narrative is that, once the scary thing doesn’t happen, people are so relieved, they don’t realize they’ve been played for ratings. We saw it yesterday when the media spent all day hyping a national emergency declaration that was obviously not going to happen. We’ve seen it with the constant stories about Trump firing Mueller and magically pardoning everyone. As a consumer of news, the key is to figure out which prevailing narratives make no logical sense, and ignore them accordingly.